In my young career as a Certified Strength and Conditioning Specialist I have learned about many key principles that must be considered when designing athletic performance programs for athletes. The most recent of which is force vector training and its high level of transferability into sport performance. I learned that some traditional strength and power training measures can have little influence on sport performance, due to their lack of specificity to the sport. Particularly, to the lack of movement specificity observed in that sport. “Train movements, not muscles”. Any pugnacious strength and conditioning coach will tell you this is a key to training athletes. But what does that statement actually mean? Honestly, I thought I had a good understanding of what that phrase meant. Then I was exposed to force vector training with Dr. Mike Young. I have since created a new understanding of the notion “train movements, not muscles”. Force vectors are naming conventions given to a force, based off the direction the force travels as it is placed against the body. From physics we know that as force acts on a body traveling in one direction, the body will perform work to meet that force, traveling in the opposite direction. We have come to find, that exercises that involve horizontally directed forces have a higher carryover in sporting movements of a horizontal nature (Contreras et al., 2017). Exercises that involve vertically directed forces have a higher carryover in sporting movements of a vertical nature (Contreras et al., 2017). There is a recent preliminary study by Fitzpatrick, Cimadoro, and Cleather (2019) that does not fully support force vector training. Continuing to use the force vector theory, as we currently understand it, is still an effective training measure but more research should continue to be done to help the field grow. Axial- Production of force against the body, traveling from the top to the bottom of the body, causing subsequent movement of the body in a vertical direction. Anteroposterior- Production of force against the body, moving anteriorly to posteriorly, causing subsequent movement of the body anteriorly. Lateromedial- Production of force against the body, moving laterally through the body, causing subsequent movement of the body from a medial to lateral direction. Posteroanterior- Production of force against the body, moving posteriorly to anteriorly, causing subsequent movement of the body posteriorly. Torsional- Production of force against the body due to applied torque, causing subsequent rotation of the body in the opposite direction of the applied force. Axial/Anteroposterior Blend- Production of force against the body, halfway between axial and anteroposterior at roughly a 45° angle, causing subsequent movement of the body in the opposite direction of the applied force. Hopefully, reading these descriptions gets you thinking about movements in the gym, that can be used to fulfill the needs of your specific sport. Strength and conditioning professionals have come to understand the importance of selecting strength and power training exercises based on the force vectors of that sport. It is this understanding that has steered training methodologies toward maximizing human performance. 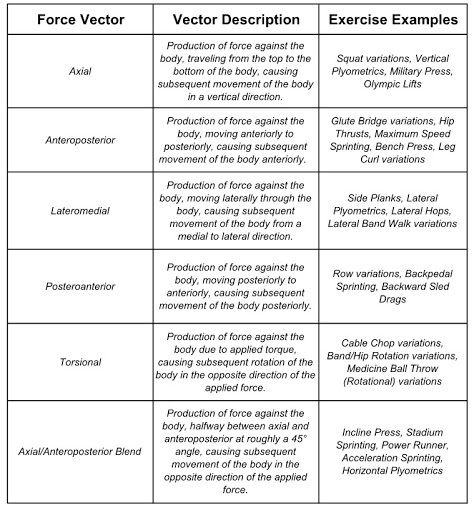 Below, is a list of exercises that can be used to train within each of the force vectors. Keep in mind a single movement or exercise can comprise multiple force vectors based off loading parameters like contralateral hold, unilateral or bilateral stance, or implementation of a rotational element to the exercise. An example of this is sprinting. Not only is sprinting a combination of unilateral and bilateral efficiency, it is also a movement that acts on multiple force vectors. As sprinters accelerate off the blocks, propulsive forces elevate and extend their hips to the point that they become upright at maximum speed. Through the acceleration phase, sprinters are acting against an axial/anteroposterior blend force vector until they come upright, to which they are acting against anteroposterior force vectors at maximum speed. Once you start to break down and analyze the movements in a given sport, you see the importance behind implementing force vector training into your established methodology. Let the movements of the sport dictate the movements in the weight room. Not the other way around. Force vector training is not its own training methodology. It is a variable, of training specific sport movements, that should be utilized to push the adaptation response in athletes. It seems the concept of force vector training had its inception in 1977, when Yuri Verkhoshansky discussed his theory of special strength training through a principle of dynamic correspondence. Dynamic correspondence looks at the transfer effect of training and how it directly affects an athlete’s ability to perform during his/her sporting event (Verkhoshansky, & Siff, 2009). It was popularized years later with the release of Supertraining, and a monumental shift from general physical preparation to specific physical preparation for athletes took shape. As the athletic profile of an athlete grows, they see less dynamic correspondence from general strength training parameters. To improve his/her ability to perform in a sporting event, a greater emphasis needs to be placed on specificity in the weight room. Successful coaches understand the actual sport movements and the athlete’s ability to replicate those movements during training, are crucial components to factor into the program design. As strength and conditioning coaches we can use force vector training as another tool, to help guide our training philosophies while working with athletes. When we develop muscle groups along the direction of the force vector, used in sport, we see a higher rate of dynamic correspondence. A single movement or exercise can comprise multiple force vectors based off various loading parameters. It seems that force vector training is best utilized when training high level athletes, who are seeing minimal progress from traditional strength training measures. Below is an easy to read table that gives descriptions and exercises of each force vector, for you to use. Contreras, B., Vigotsky, A. D., Schoenfeld, B. J., Beardsley, C., McMaster, D. T., Reyneke, J.T., & Cronin, J.B. (2017). Effects of a six-week hip thrust vs. front squat resistance training program on performance in adolescent males: A randomized controlled trial. Journal of Strength and Conditioning Research, 31(4): 999– 1008. Fitzpatrick, D. A., Cimadoro, G., & Cleather, D. J. (2019) The magical horizontal force muscle? A preliminary study examining the “force-vector” theory. Sports. 2019; 7(2):30. Verkhoshansky, Y., & Siff, M. (2009). Supertraining. Sixth Edition. Rome: Verkhoshansky.